The inclination of Earth's axis gives rise to different seasons throughout the year, which in turn determine the behavior of all living organisms. Without seasons, our planet would be vastly different than what we know it to be. 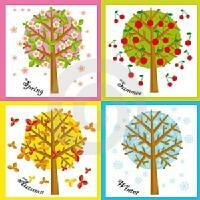 Most places on the planet have four distinct periods lasting three months each: spring, summer, autumn, and winter. We normally associate each season to different climactic conditions and we usually have a favorite, depending perhaps, on the kinds of activities we carry out in each, or the landscape, the clothes we wear, the food we eat...Vote for your favorite season!